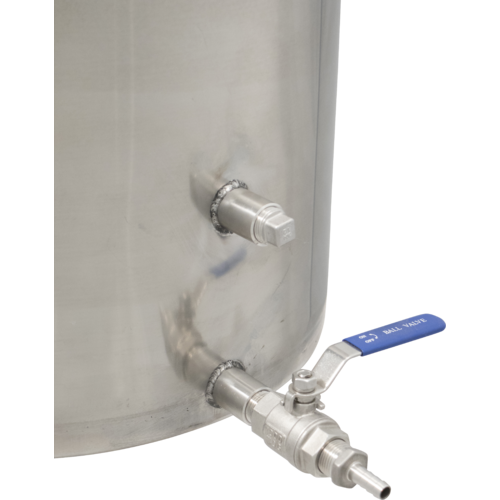 Includes a ball valve and a threaded adaptor to 3/8" barb for easily attaching transfer tubing. Also included is a threaded 1/2" plug for the thermometer port. Thermometer is not included and can be added at any time. 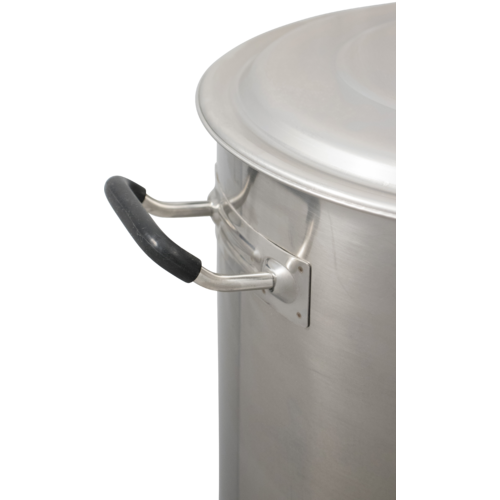 I have been looking to go full boils for a while and have been shopping online everywhere for a 15 gallon stainless pot. When this was a deal of the day I could not , not buy this. 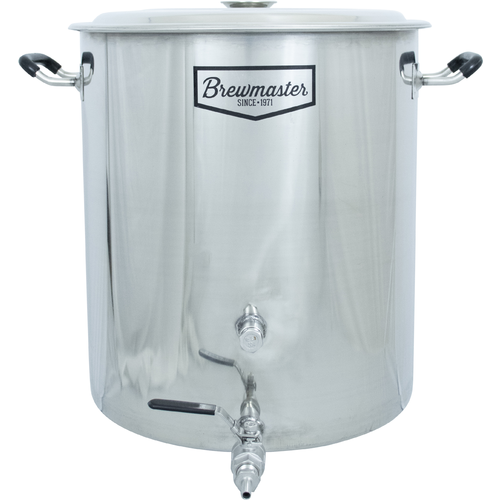 No more boil overs, full boils for better beer. 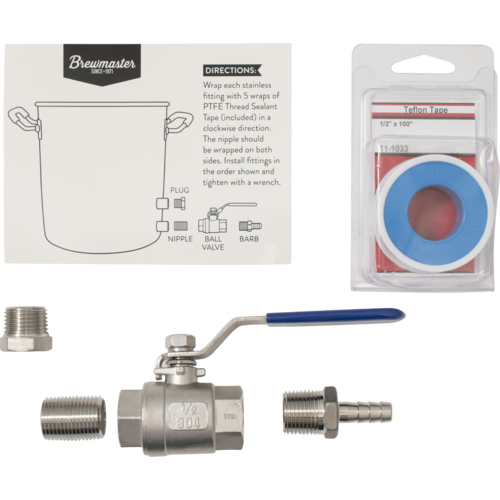 I picked up the thermometer and ss ball valve to use with it. Quality of the pot and welded couplers are good. The lid is cheap but that is not an issue. It will be nice not being paranoid about boil overs. Also brewing 10 gallons at once is a nice option. If I ever move to all grain hopefully this pot will be useful, but right now I am very happy just brewing extracts. Everything that everyone stated. Plus I asked morebeer if both fittings could be used from the inside. They told methat only the bottom one could be threaded into. They are incorrect. I thread into both. Minor but something. I grab it by the fittings and it has not failed at the welds yet. I've owned this kettle for over a year and have found it to be very reliable, no issues with the welds etc. Before this I had bought the much more substantial MoreBeer's Tri-Clad 8gal kettle. The Tri-Clad series pot will likely outlive this economy one, but its heavy and I'm happier moving/cleaning/brewing bigger batches in this one. 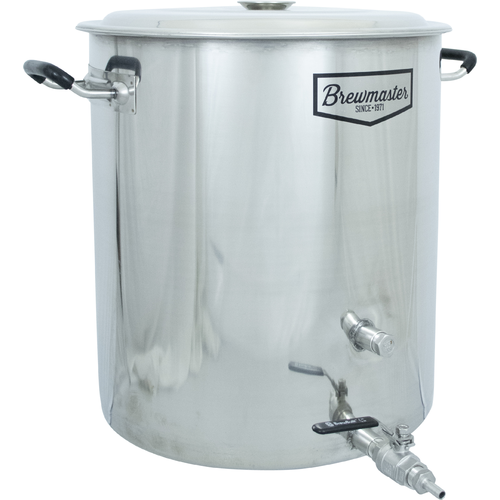 I bought this because I was in the market for something I could do full volume boils on 5 & 10 gallon batches as well as experiment with BIAB techniques (which the upper port is useful to install a thermometer). Currently using as my boil kettle, but I may buy another for HLT when I get a little extra cash. I like the height to width ratio better than most of the "higher quality" 3-layer bottom pots. Seems sturdy enough, although I have only picked it up with about 3 gallons in it (handles seem a little flimsy which is the reason for 4 stars). Sure the lid is very flimsy, but I only use it post boil for whirl-pooling. The pot is plenty sturdy and holds a 10 gallon batch with little issue. The bottom could be thinker, but the price would then be doubled. I have one for the HLT/Boil and another for Mash/lauter. The welds are perfect. You can't beat this for the price. I've used this as a boil kettle and a HLT and it works great. The lid is THIN, but that hasn't caused any issues so far. I couldn't be happier moving into this kettle. Price couldn't be beat and welds are great. I will be adding another soon. 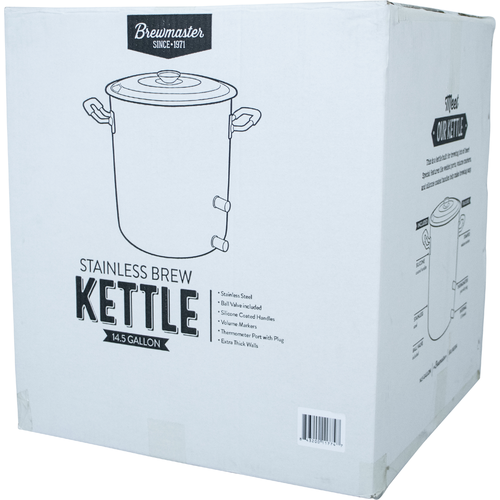 I was a bit apprehensive ordering the "economy" kettle, but I could not pass up the price (especially when it come up for deal of the day) for a kettle with two welded ports. I was astonished by the high quality of this kettle. 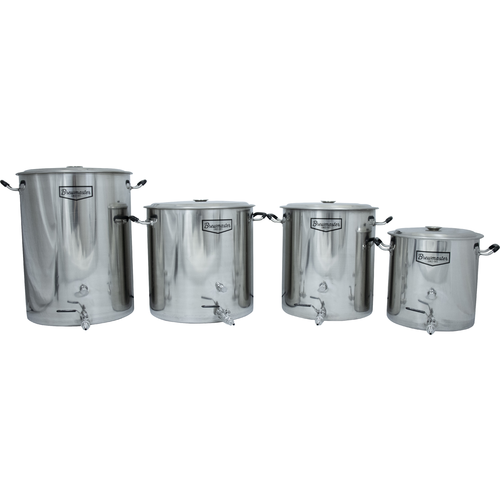 It is great for 5-10 gallon batches and helps get the wort to a vigorous boil in no time. With my boil off rate, a ten gallon batch nearly filled the kettle for pre-boil capacity, but I brew mostly 5 gallons anyway. 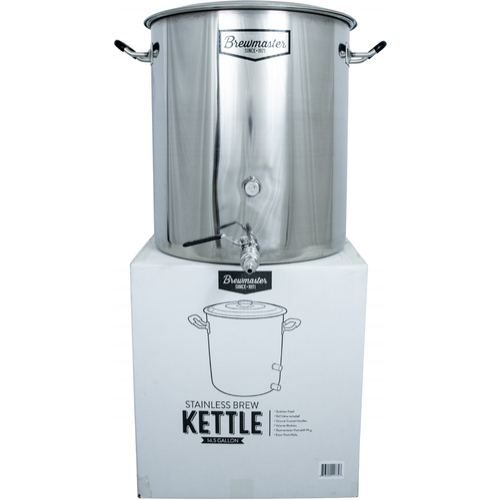 I highly recommended this kettle, especially if you can wait for it to pop up as deal of the day to save some more cash. I have this and the 8.5 gallon economy kettles. For the price, I could not find a better deal. I gave 4 stars because the lid is very thin, but that has not caused me any issues. I do plan on buying another to replace my 8.5 soon. Great kettle!! Bought the pot to use as my HLT. Works great. I did not give it 5 stars becuase the polishing compound around the welds was a pain to remove. 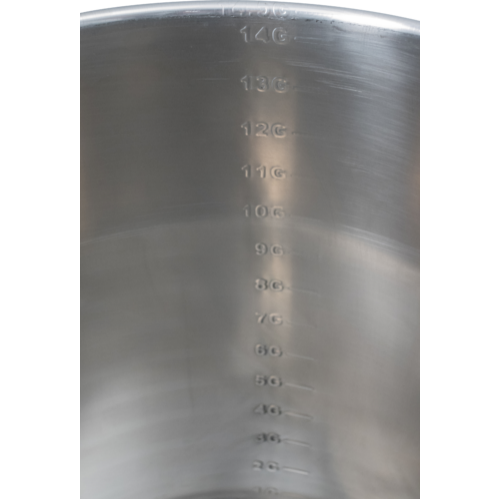 Planning to buy another and making it into a mash tun.